Nearly all of the Chinese food we eat in England is Cantonese in origin and doesn’t fully represent the kind of food that is actually eaten by millions of people on mainland China every day. Cheap, tasty, varied dishes served in small portions and shared between whoever is eating – communal and informal is the name of the game, and it’s one which Chop Chop in Edinburgh have got down to a fine art. Having read various reports of how good their dumplings were it was these that we gravitated towards on the dizzyingly broad menu, though on the recommendation of our waiter we in the end opted for an Unlimited Banquet for two. Essentially a selection of dishes are brought out for you to try at a fixed price per person (£20.50 per head), with no limit on re-orders. So if you try a dish and really love it, feel free to order another portion for no further charge. 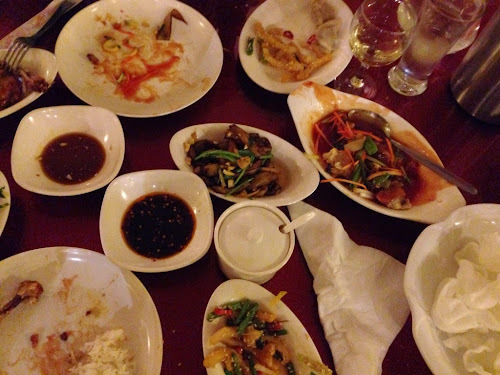 The dishes we found ourselves re-ordering were the deliciously delicate pork and prawn dumplings – chewy, substantial dumpling giving way to light and flavoursome meat – plus the expertly fried squid and aubergine dishes. Crispy squid is always a winner but it was the aubergine that really surprised me. Firm and meaty, it is apparently twice cooked to draw as much moisture out as possible, and the second quick frying with spices and garlic creates a dish of infinite snackability. Addictive to say the least. A simple cucumber salad with lots of sugar and vinegar was also a nice touch as it really helped to counteract the rich spiciness of other dishes such as the spicy chilli beef. The make-your-own dipping sauce is a nice idea too, allowing you to tailor the amount of chilli, soy or garlic to your tastes. 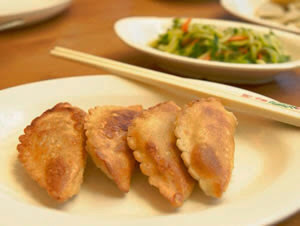 If you’re looking for great value, wholesome, traditional Chinese family cooking, then Chop Chop is a sure fire hit.